With frosting or without, gluten free candy corn sugar cookies are a fun and festive gluten free Halloween sugar cookie! I know that not everyone does, I know people who hate it! But I love candy corn. I thought it would be really fun to put candy corn into gluten free sugar cookies. I even cut the sugar cookies into the shape of candy corn. I ended up with these delicious gluten free candy corn sugar cookies studded with candy corns. 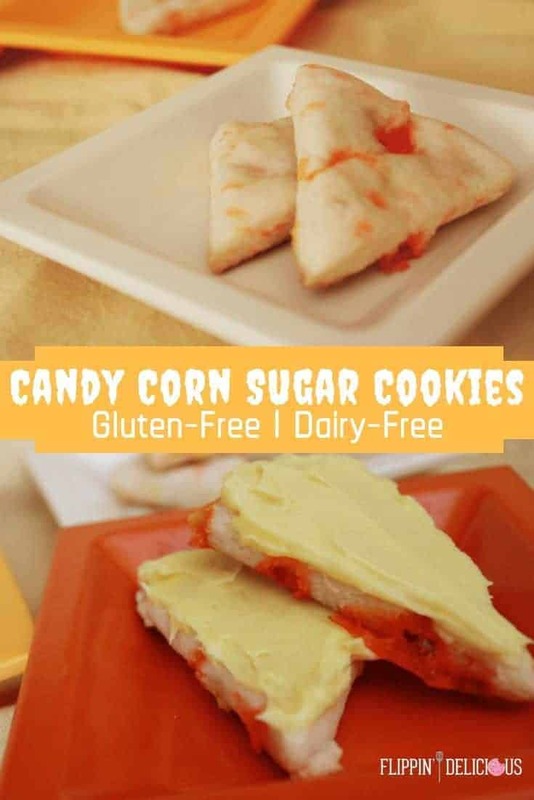 The candy corn melts into the gluten free sugar cookies. 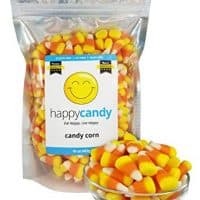 Every other bite you hit a sweet chewy candy corn bit. 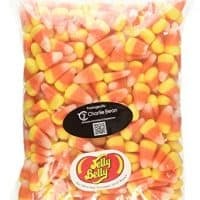 So yummy, if you love candy corn that is. This recipe is a spin-off of my famous gluten free sugar cookies that is perfect for Halloween. If you aren’t a candy corn fan, or you are a sugar cookie fan, check out my frosted Gluten Free Halloween Sugar Cookies. 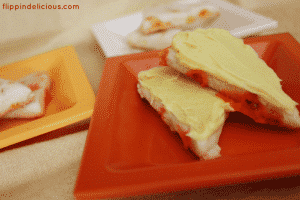 How to make candy corn shaped sugar cookies without a cookie cutter. After you roll out your cookie dough, cut it into a rectangle that is approximately 3.5 inches on the short side. Then cut it into acute triangles with a base that is about 2.5-3 inches long. When you cut out your cookies this way, they fit together like puzzle pieces of upside down and right-side-up candy corns all making a parallelogram. This is way to much math for me! Cut them so they generally resemble candy corn, using a butter knife. Easy! 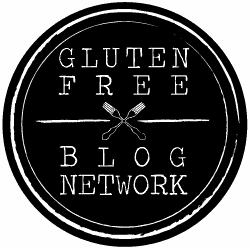 How to make gluten free candy corn sugar cookies? For easy and less-mess rolling, roll out your gluten free sugar cookie dough between two pieces of plastic wrap. Then you don’t have to add more gluten free flour, which could make your gluten free candy corn sugar cookies dry or crumbly. Is candy corn gluten free? Something important to note, not all candy corn is gluten free. Candy corn can easily be gluten free, one of the big issues with most candy corn is the risk of cross contact at factory. I recently found candy corn from a peanut-free, wheat-free facility at my dollar tree. 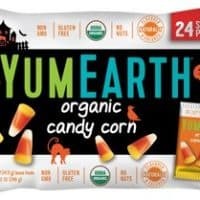 Some other candy corn brands that are gluten-free (as of 10/18 when I’m updating this post) are Yum Earth Organic Candy Corn, Jelly Belly Candy Corn, Happy Candy Corn, and Brach’s Natural Sources candy corn (their other candy corn products are not gluten free, from what I’ve heard). I’ve rounded up some gluten free candy corn from Amazon, so you don’t have to go searching. 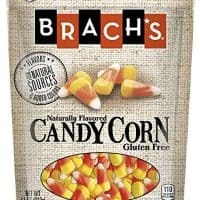 You may be able to find some of these safe gluten free candy corn in your local stores, too! I have one question for you before I share my recipe. Do you like candy corn? Tell me in the comments! Roll the cookie dough between two sheets of plastic wrap about 1/4- 1/2 inch thick and then cut into a rectangle that is about 3.5 inches on the shorter side. Cut into acute triangles. It will look like a bunch of right-side-up and up-side-down candy corn put together like a puzzle piece. Reroll and scraps and repeat. If desired, frost with my vegan buttercream frosting or american buttercream frosting. Be sure to use gluten free candy corn. Not all candy corn is safe for those with celiac! 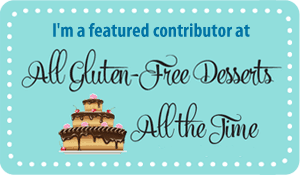 I've mentioned some gluten frre candy corn in the article above. YES! I love candy corn and the candy pumpkins even more! What a fun and yummy looking recipe! Thanks Jules! This was a recipe I did in my first few months of blogging.The pictures are a little old, but I thought the recipe is still fabulous and people need to make these so I republished it. Halloween is my favorite time of year. This recipe is very creative and I bet tastes great.